I’ve recommended Dell computers for many years. But my confidence in them was shaken when I got a new laptop in Fall 2004, and I ended up in “Dell Hell”. This is the story: ridiculous, but even somewhat funny. As you might expect, I run my computers pretty hard since I work 10-14 hours/day, seven days a week to bring you True and other stuff, so I get a new one every three years or so. This time I decided to switch to a full-time laptop; I gave my desktop to my new assistant and ordered up a new Dell Inspiron laptop. After finally getting it all set up the way I wanted, all was well for a few days until I came into the office, pushed the power button to get started …and nothing happened. It was the Tuesday before I was to leave the country — early the next Monday. “No problem,” I thought: the one time I needed service Dell was there for me, and I did pay extra to upgrade my service contract on the laptop. After spending the requisite hold time and doing everything the tech asked me to, including taking the computer half-way apart, he declared what was obvious to me from the start: a tech would have to come out to fix it. And there began my trip into Dell Hell. I told him time was short as I was leaving the country. He assured me the tech would call by noon the next day and make an appointment to come out. I was relieved; I canceled a few appointments so I could be home, but by 3:00 or so the next afternoon it was pretty obvious that no one would call. I got back on the phone and back into the hold queue. I was finally told there was no way a tech could get to my house that day — and there never was a chance of it. I asked to talk to a supervisor; I needed to get the thing fixed! The customer service rep promised a supervisor would call back the same day. My wife was dubious: call customer service, she said. I did …and was told there was an “issue” with the motherboard of my computer; replacements were not available. Uh oh. I again asked for a supervisor, and was again told I could expect a return call the same day. Good for them: both supervisors actually called back that evening. But a funny thing had happened in the meantime: a courier arrived with replacement parts. “Huh?” the first supervisor said: his system didn’t show that any parts had ever been shipped to me! Great system you have there, guys. “What’s in the box?” he asked. Hell, I don’t know. I opened up the box and tried to describe each part to him, but one thing became apparent: no motherboard. He told me that the first tech had given me an “unrealistic expectation” by saying that a tech would arrive the next day. I emphasized that I needed it fixed by the weekend since I was leaving the country. When the second supervisor called and I told him the story, he declared I was absolutely not given an “unrealistic expectation,” I should have had a tech the next day …except that there was this “issue” with the motherboards. Great: does that mean I have a lemon? Oh no, he assured me; it’s just that replacement motherboards were late coming from the overseas factory. He said it was unlikely that I’d get my computer fixed before I left on my trip, and apologized. Because of the out-of-stock motherboard issue, I ended up having to do my overseas travel with my old, slow, backup laptop. When I got back the motherboard was here waiting, so I called the local tech. He said sorry, but while I was out of the country my service ticket had expired and I’d have to call the service company back to reactivate it. After three days of voice mail jail with them, I gritted my teeth and called Dell again, wading through their menus and waiting on hold. The customer service rep said yes, the ticket was expired. Could they just reactivate it? Nope! Their solution: start all over with tech support! No, I said, I’m just not going to go through all of that again. Surely a supervisor can simply get the old one reactivated, or at least copy the notes over to a new ticket. A supervisor will call you back “today,” I was told. That was November 3. No supervisor ever called. In the True sent to subscribers on November 5 I told the story — and then the phone calls started. One from a Dell exec who happens to be a True reader, and another from a Dell exec who got a copy of the issue forwarded from a relative who’s a reader. What they did is discussed in the update section below, but first just a few of the horror stories readers told me after reading mine. You can no doubt find a horror story for every manufacturer. The question becomes, then, does Dell have more than its share? Which is to say, is their customer and technical support worse than “average”? Some of my readers definitely think so! Their comments are in the Comments area below; I’ve since turned off Comments for this page for reasons I’ll discuss below. Spare Parts, Anyone? “Almost enough to build a whole computer.” Once I convinced Dell support that my computer really was broken and a tech had to come out, Dell shipped me the parts they thought the tech might need. I have no idea what all of this is, but I’ve been able to identify: a motherboard, an LCD display, a modem, a WiFi card, a display card, a power supply and cord, a front escutcheon, the keyboard surround, RAM, driver CDs and (as you can see) much more — all from the stack of boxes behind the actual laptop in question. When I finally got the attention of Dell executives and they saw what I was sent, one remarked that I had “almost enough to build a whole computer.” Well yeah, but would it work? 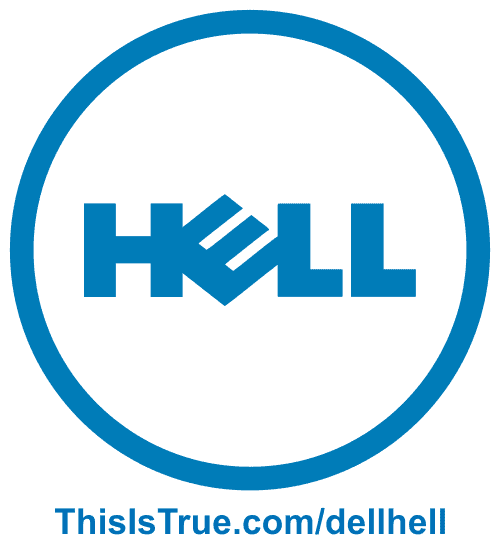 In my first discussion of this issue in the newsletter, I mentioned that DellHell.com was already registered …to Dell (no site there, though). That wasn’t meant to imply I’m interested in starting a web site like that. This page will be plenty, thanks. As noted in the Horror Stories in the Comments, you can certainly find horror stories about every manufacturer; no one gets it 100 percent right 100 percent of the time. The problem is, you shouldn’t have to have a newsletter with a six-figure audience to get attention. It worked for me, but not everyone has such a resource. So yes, first of all, publishing my mini-rant in This is True did get some attention from Dell. Two Dell execs called and apologized profusely, and I gave one the other’s name so they could coordinate their efforts. Dell says they try very hard to satisfy customers with problems that haven’t been solved by tech support. The hard part is finding out who is having problems. They said they actually have employees who surf online forums looking for horror stories, and then contact the person and help them. And, apparently, they have the authority to actually help. Tip to Dell: if you want to get horror stories, how about activating a site at DellHell.com to solicit them? Yeah, some will be from cranks who will never be satisfied, but maybe you’ll find out that you’ve sic’d a collection agency on someone who returned every part you sent to them! I asked one of the execs what people who don’t have a six-figure circulation newsletter should do when they’re not getting help on a big problem. The reply: Dell is working on a better process to help escalate the biggest problems to someone with authority to intervene — but it doesn’t exist yet. Kudos to them for being honest about that, but it’s sad they got too large too fast to have that in place already. I asked him if he could fix some of the worst problems shown on this page, and he agreed to look into them personally. As for me, he promised to replace my computer and “do what it took to make me happy.” Is it because I have a large publication, or because someone with authority heard me scream? My guess: a little of both. I’ve shipped back the bad system and his assistant walked the order for a replacement through the system. The replacement system is far, far better than the old one, and has led me to a number of Lessons Learned that you can use to help you next time you order a system. One would think that any decent computer would be fine being run 24×7, but perhaps for truly heavy use it’s good advice. Dell has three lines of laptops: the Inspiron, which is essentially the consumer model, the Latitude, which is for business use (and the model line Dell employees are issued), and the Precision, which are scientific workstation-level machines. Dell agreed to take back my Inspiron 5150 even though it was past the 21-day return period by the time they heard me screaming. I replaced it with the same model their employees use: the Latitude D600. If you only need light use from your computer, perhaps the Inspiron is enough. But if you, like me, use your computer hard for long periods of time, and/or lug it around a lot on travel, perhaps the adage “you get what you pay for” applies. My lesson learned: I must move away from the consumer models, which are designed for individuals who are extremely price-conscious. The surprising part: the more-industrial-strength Latitude line really isn’t all that much more money for a similar configuration, but I’ve heard from many that they’re significantly more rugged — something Dell told me, too. Now that I have one I must agree: the Latitude is clearly more solidly built. It’s also smaller, significantly quieter, and runs cooler than the Inspiron it replaced. As a concession (see “promised to do what it took to make me happy”, above), Dell upgraded my service contract to “Business Premium,” meaning that if I call in I start with “Level 2” tech support — more senior, and more knowledgeable, techs. It’s a $327 add-on for my system, but may be worth it for those who truly depend on their computer, as I do. I will not be satisfied with “basic” service contracts in the future. When it comes to Dell, be sure to go in via the “small business” route rather than the “home user” door — the “made-for-home” machines are slanted toward being the lowest-cost machines possible for price-conscious consumers. If that’s how you want to be treated, fine. But my business depends on quality computers, and (like most businesses) I’m willing to pay a little more for better reliability and better service. Accepting crappy treatment is false economy. After reading this page a Dell employee (and long time True reader) passed along some helpful advice, responding to my note that I bought the Inspiron 5150 when it was quite new, and that it was discontinued very shortly after. She wrote: “It’s been my experience that our systems are either so solid they are still working years after their warranty, or are so bad they disappear quickly. It occurred to me that you might be a good person to pass on a tip that was given to me by a veteran tech at Dell: Never buy a product when it first comes out. Wait a month, then check the Dell Outlet. If you see too many of them available, the system is not a bargain at any price.” Good advice. If you have a terrible, ongoing problem with a Dell computer, I hope you have a gigantic-circulation online newsletter: you saw what worked for me. Since few have that option, my realistic suggestion is, first, be sure you have really exhausted the regular chain of complaint — tech support and customer service. If that doesn’t work, keep complaining. Go to the top: write a clear summary of the problem and send it to the corporate headquarters, addressing Michael Dell himself. I’ve put his address at the top of the page. Will he read your letter? Heck no. But he has people to read — and act on — such complaints. If you can finally get your complaint heard by the right person, they will quite likely help you. That, at least, is what I’ve been assured by more than one senior Dell executive, and I think they’re telling the truth. The same sort of procedure will probably be reasonably effective with any company which respects its customers — IBM, HP, Apple, and most of the others. But I wouldn’t hold my breath when dealing with the bottom-feeding companies that only sell through discount stores…. Though comments have been turned off after deleting scores of them, with ALL CAPS, run-on sentences, and other signs of retarded development. I’ve only left the original horror stories and the last comment — practically the only intelligent one of the later bunch. The rest were simply not worth reading, and my “rule” is that if a comment doesn’t actually add to the concept being discussed, it’s not included on the page. Related Page: Dell Hell and Dumb People or, just how incredibly stupid can people be? Very! My Dell Hell began when I purchased a Dell laptop. I am very computer literate so I don’t often contact Tech Support. However, upon receiving this Dell I could not get dial up networking to work — it became clear to me that the modem was dead. I called and they gave me pretty much what they gave you — checking and rechecking things I had done already, etc. and then said I should send back my computer for “repair”. I said this is a brand new out of the box computer and I don’t want it repaired, I want it replaced. They said they could not do that. They agreed to send me a new modem (I told them I would be happy with a card modem which would replace the defective internal modem) and I could install it. That they did — within a few days I got the card modem but in the meantime I found I did not like the laptop at all, for various reasons, and I contacted them and told them I was returning the Dell for a full refund. In addition I was returning the Dell Modem they sent me. They agreed to this and I was credited with my full refund for the Dell Laptop. Within 6 months I was notified that I owed them $70.00 for the modem they sent me. I explained that I returned it and they seemed to accept this. This went on for over 2 years — every few months I would get a bill for the modem, I would call and explain and they said they would take care of it. Well after two years I got a letter from a collection company saying that my account was turned over to them for collection. I also wrote and explained to them but that was useless. Since then (going on 4 years total) I have received an average of 3 calls a week from the collection agency, innumerable letters and messages left on my machine and I have even recontacted Dell to trying to resolve this. They said it was now “out of their hands”. Well, needless to say, I will no longer do any business with Dell, for myself personally or any customers. I recently got a letter from the collection company offering to let me ‘settle’ the dispute for $40.00. I declined. DELL HELL to be sure. I can sympathize with your Dell experience. My company purchased a Dell laptop, which began exhibiting problems with its LAN connection fairly early on in its time with us. We sent it back to Dell under our mail-in-repair service contract, and received it back soon thereafter. While the LAN connection had been repaired (through a motherboard replacement), the battery would no longer charge properly. This set off a chain of events that included multiple additional shipments to Dell, the introduction of new problems, a replacement battery, and numerous calls to both technical support and customer service. The most incredible part was when a senior customer service representative told us that our problems were due to the fact that we bought a laptop that was not designed for everyday use, and if we had bought a more expensive model, our everyday use would not have caused such problems. My boss and I looked at each other and asked the representative to repeat himself, which he did. We weren’t even sure how to react to that. We finally did get a replacement laptop (which we’d been requesting since the first faulty repair), and it had problems with its screen. In the end, we are now the not-so-proud owner of a Dell laptop which we have relegated to use by a part-time intern, and six Sonys, which have generally performed well and which have been backed by much more responsive customer service on those few occasions when assistance was required. Admittedly, the Sonys cost significantly more than the Dell, but it’s sometimes true that you get what you pay for. You haven’t even begun to delve into Dell Hell yet, but now that you’ve reversed your credit card charges you will surely suffer the 7th level of Dell Hell when Dell Finance (or whatever they’re actually called these days) get their tentacles on you. My father found out about that level of Dell Hell a couple of years ago, when he ordered a computer and monitor and then he decided he didn’t actually need them (a different story) and had them shipped back to Dell. So far, so good, right? They got all of their merchandise back and I think he only had to pay shipping. Well, it seems that the folks from Dell and Dell Support don’t actually communicate much with Dell Finance and it seems that the slime at Dell Finance doesn’t actually trust the folks at Dell Corporate or Dell Support. The slime at Dell Finance kept insisting that my father pay for the computer that he sent back, the same computer that Dell would agree had in fact been returned to them completely intact. To make a long, ghastly story short, the North Carolina Attorney General’s office needed to be involved, a registered letter to Michael Dell was returned from the Corporate address marked “unknown” but, eventually — after many, many months and a ruined credit rating (my father’s) — Dell finally stopped calling and writing letters to him. If you think Dell support in the US is exciting, you should try Europe. At least (I believe that) they haven’t outsourced European support to India, but there are still language problems. When I bought my new desktop in Paris a couple of years ago, I specifically asked if I could get support in English. I’ve lived in Europe 12 years, and I am not going to go hungry in either French or German, but for tech support I think I’ll do better explaining things in my native language. I was assured that English would be no problem. The first time I had a problem, however, I called the support line, got an English speaking operator who assured me that I could speak to an English speaking technician. The technician who came on the line, however, told me in French that he didn’t speak English, and if I wanted English support I should call the UK. I called Dell again, went through the same loop again, and decided to try their web site. I had no intention of paying European international call rates during normal business hours to be put on hold in the UK. I went to their French web site, and there was even an option to view the site in English. I submitted my problem, and got a quick response in French saying that I must submit my problem in French. I tried submitting my problem to the US and UK sites, and was told that since I bought my Dell in Paris I would have to submit my problems to the French web site because the other sites had no information about my computer in their database. I order lots of Dell computers here at my job at a large corporation. They are truly a nightmare to deal with. Last Christmas Eve my boss and I spent two hours on the phone with one of their reps (in India) trying to convince him that, among other things, Wisconsin is a state, not a city. I once had to call them to change the ship-to address on a system I ordered for a customer. I was informed by Dell that I could not change the address since the package had not been sent yet. I was told I could only change it once the package was en route. They offered to email me when they shipped the package. I still haven’t received that email. We order perhaps six or seven a month. Every time we order, they assign us a brand-new customer number, even though we use the same information every time we order. This creates a nightmare when we need to contact them about an order. We were told that we should order through our “special” representative. But every time we do that, it costs more. Earlier this year, when I was home between deployments, a friend who has a Dell asked me for help because when he has a problem with his video card, the person he ended up with, wherever they have now out-sourced their technical support to, had him disconnect all the ribbon cables inside the machine, remove the processor and the RAM, and then, two-and-a-half hours into his call (most of which was spent on hold), they were disconnected. I put everything back together for him, and the video problem was still there, so I pulled the video card out, simply reseated it in the AGP slot, started the machine back up and PRESTO! It was fixed. Never again do I intend to say anything favorable about Dell. But even this was better than the support that Gateway provides…. Although I find many of these scenarios to be a fault of Dell’s, some of these are just ridiculous. For the consumers that have decided they are going to send their unit back to dell and not pay on their account, you are morons. Sending your computer in a box to some dell address you find online is the equivalent of throwing it out the window. Furthermore, you apparently plan on throwing your credit out the window by not paying on your account. Dell offers north american support for $149 per year on top of your existing warranty. Yes, you have to pay extra to speak with their highest level technicians, get over it. The cost is only $99 per year if you sign up when purchasing your machine initially. I recommend you get their “your tech team” service and save youself a whole bunch of frustration. I have had my fair share of dell hell incidents and your tech team is the only thing that has done me right. Even so, some of you people just need to use common sense, crying about talking to Indians who “don’t speak english” will get you nothing but being more upset. Bottom line: I can’t spend my time reading over such garbage, especially when half of you are posting to ask me how to contact Dell. Hello? What brought you to this page in the first place?! It’s showing on the page in a big box! You want people to read your whiny gripes, but you can’t bother to read the page to get the information you’re looking for? Please. And the next person that looks up my phone number to call me to ask for help will get the privilege of being hung up on. I am not Dell, and I cannot help you get satisfaction from Dell. Use your brain, and maybe some patience.